The Haddon's Carpet Anemone is a relatively large anemone that is bright blue in coloration. They have nematocysts and a single body cavity that serves as the stomach, lung, intestine and circulatory system. The only opening to the body cavity is the mouth in which all water, food, and gametes pass through. Surrounding the mouth are many tentacles equipped with stinging nematocyst cells used to capture food and manipulate it towards the mouth. Haddon's Carpet Anemone is a sedentary animal that is able to attach to hard surfaces on the sea floor. Northern Great Barrier Reef, Fiji Islands to Mauritius, and Australia to the Ryukyu Islands. 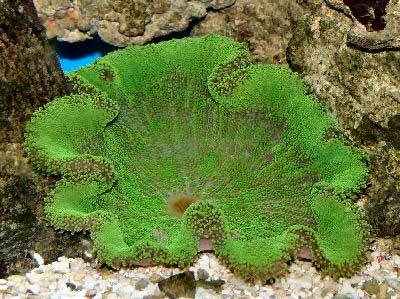 Haddon's Carpet Anemone is a species that is used in the marine aquarium trade. It is one of the largest species of anemones available commercially. "Sea Anemones Classification". University of Kentucky. Retrieved from: http://www.nhm.ku.edu/inverts/ebooks/ch1.html.